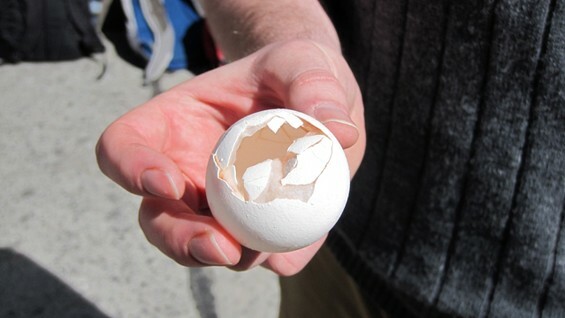 The annual Egg Drop, where cunning devices compete to safely shepherd the fragile package of a chicken egg free-falling 30 feet, returns to Cooper's Foundation Building Tuesday the 18th at 11:30 AM. Held outdoors, the Egg Drop is free and open to the public to watch and participate. Following an hour for the construction of the egg-carriages, the drops begin at 12:30. Once a springtime event, it has moved to coincide with the school’s Fall Festival. All members of Cooper Union, and even the public at large, are invited to participate either solo or in teams. “We are hoping for around ten teams at least,” said Sharang Phadke, Assistant to the Administrative Chair of the Engineering Council, which organizes the event. Once held in the Spring, the Egg Drop has moved to coincide with the school’s Fall Festival where clubs set up information tables in Peter Cooper park. Contestants must create a device that holds the egg safely as it is dropped from the balcony on the Foundation building to a target below. Winners are determined by a formula that factors in the status of the egg, the distance it lands from the target and the weight of the carriage. Egg Drop participants can either arrive with their device pre-built or else create one on the spot with free materials provided by the Council. First prize is $60 and an egg.